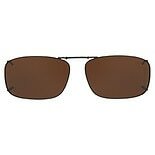 Oval clip-on sunglasses are accessories that allow you to change your oval-shaped glasses into sunglasses at the drop of a dime. There are several different options for you to choose from when purchasing these types of accessories. 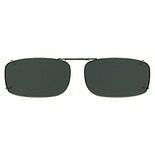 Clip-on sunglasses typically come with polarized lenses that help block the glare from the sun or bright areas. Most also protect your eyes from 100 percent UVA and UVB. 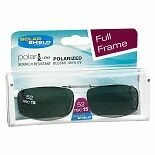 Walgreens.com offers oval clip-on sunglasses from well-known brands like Solar Shield. 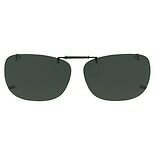 Sunglasses come in many different styles, shapes and sizes, including oval. 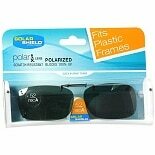 Some clip-on sunglasses are designed to fit over any type of plastic frame. Other sunglasses choices include clip-on glasses that have a light frame and ones that fit the full frame of your eyeglasses. 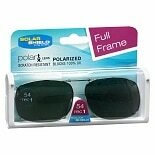 Additionally, you can purchase flip-up sunglasses, which allow you to go from sunglasses to regular glasses without the need to remove them entirely. 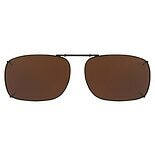 Just like with any other sunglass style, clip-on sunglasses require care and maintenance in order to keep them looking good. Keep them clean and free of dirt, smudges and specks with eyeglass cleaner. Make sure that you store them in a glasses cases to prevent damage, such as crushing or scratching, when you are not using them.